Easter 1917 coincided with the commemoration of the rising a year earlier. Up to early 1917, the Volunteer organisations appeared to have dissolved but release from English gaols saw companies of Volunteers re-organising and training. In January 1917, the Cork volunteers in their hall at Sheares Street began to regroup under Tomás MacCurtain. Close police attention led to MacCurtain’s leadership being short-lived as he was arrested again. He left behind two battalions which had been built up, comprising eight companies each. Demands were given by British Authorities for the closing of the Volunteer Hall. The Volunteers remained until the doors were closed by force on 4 June 1917 and several arrests were made. MacCurtain’s arrest was not the only one in February 1917. Terence MacSwiney was also arrested and both were brought to the Military Detention Barracks, where two other Volunteers Sean Nolan and Peadar O’Hourihane were also present. On 23 February 1917, all four were taken to Arbour Hill Barracks in Dublin. Here they were served with deportation orders condemning them to be exiled out of Ireland for an unspecified period to small English towns, free to roam them but not to return to Ireland. Tomás and Peadar were sent to Ledbury in the County of Hereford, north of Bristol and MacSwiney and Nolan to nearby Bromyard. On Easter Monday 1917. they marked the first anniversary of the Easter 1916 Rising in Dublin in their own way. 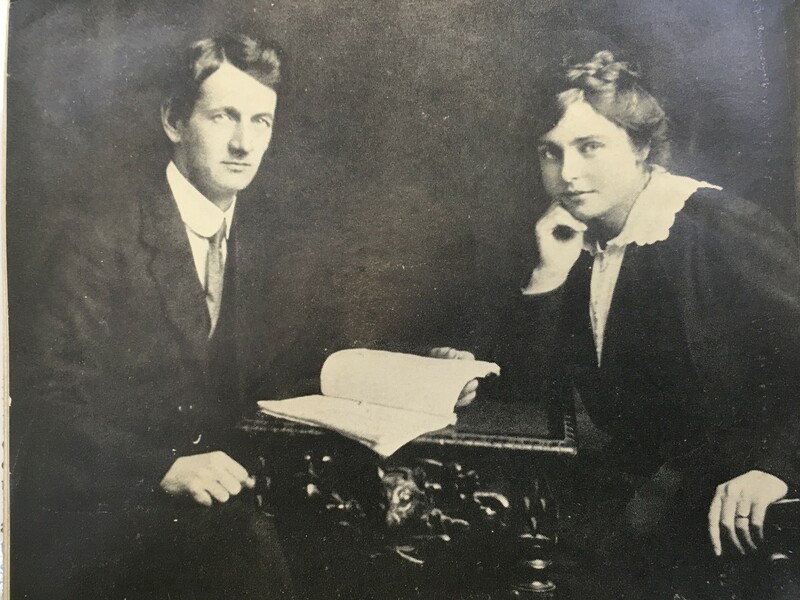 Terence and his wife to be Muriel Murphy were planning their wedding day for June 1917. Meanwhile across the country, small volunteer companies marked the first anniversary. In Dublin, on Saturday 13 April 1917 the Sinn Féin flag of orange, green and white was hoisted over certain public buildings – the old Post Office wall near Nelson’s Pillar on O’Connell Street, the AOH (American Alliance) offices in North Frederick street, and Boland’s Mills. In O’Connell Street, large numbers of young people gathered and some were noted by police to have taken to the streets breaking windows and resisting police arrest. 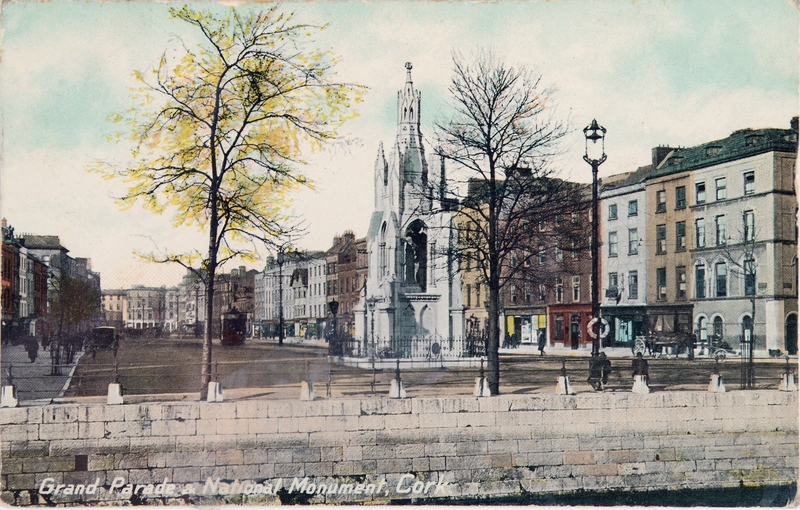 A day later on Sunday 14 April in Cork it is recorded by the Cork Examiner that four hundred processionists, many of whom wore Sinn Fein badges and rosettes, marched from the North Cathedral to Cork City Hall. At the Cathedral, a memorial service was held for persons who were killed arising out of the 1916 Easter Rising. During the ensuing march, the Volunteers sang the marching song of the Sinn Féin volunteers and also an Irish version of Easter Week. At City Hall, some persons had already entered the building, and hauled down the municipal flag replacing it by the Sinn Féin ones. The processionists sang Irish songs, saluted their flag and retraced their steps to the National Monument on the Grand Parade. The parade movements were watched by fifty police, under District-Inspector Walsh, who appealed to the ringleaders of the demonstration to disperse quietly. The police approached the mob with drawn batons and were received with a fusillade of stones. The police noted of the disorder that half the rioters were women, who served as a screen for the ringleaders. The police made a combined baton charge and dispersed the mob in all directions. The Sinn Féin flag was hauled down from City Hall by the police, but was later retrieved by Volunteers and was run up again and flew for the rest of the day over City Hall. By Sunday 22 April 1917, Bishop Cohalan, sent a letter to the priests of the Diocese for his concerns about further rebellion to be read out following letter was read at each Mass in the City’s churches. He had concerns that on a few occasions after memorial masses, processions to the National Monument were taking place; “I am reluctant to interfere with liberty on the street. The stoppage of a procession or demonstration can easily become an undue interference with liberty…a procession from a Church does not necessarily imply irreverence to the Holy Sacrifice of the mass…But processions after the memorial masses would lend to conflict and disorder in the streets. And I appeal to you all, priests and people, to remember the reverence which is due to our place of worship, and, above all, to the Holy Sacrifice, and to see to it that there shall be no procession or demonstration which might lead to disorder, no matter by whom caused, in connection with the Memorial masses”. Examples were made of Sinn Fein Volunteers by British authorities. The Cork Examiner on 26 April 1917 records the findings of a District Court-martial held at Cork Barracks into charges made against Patrick Higgins, 70 Dominick street, John Healy, 32 Evergreen street, and Jonnies Courtney. 95 Hibernian Buildings. The accused were charged with having on 7 March 1917 at the Sinn Fein Hall on Sheares Street, taking taken part in drilling without having a permit from the competent military authority. Each of accused was found guilty, and Higgins was sentenced to six months’ imprisonment with hard labour whilst Healy and Courtney each were sentenced to three months’ imprisonment with hard labour.